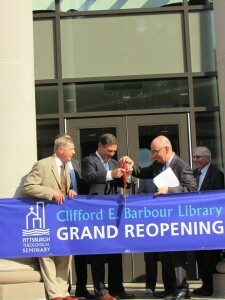 Pittsburgh Theological Seminary President and Professor of Cross-Cultural Theological Education David Esterline, right, helped cut the ribbon to open the newly-renovated Barbour Library in late September. 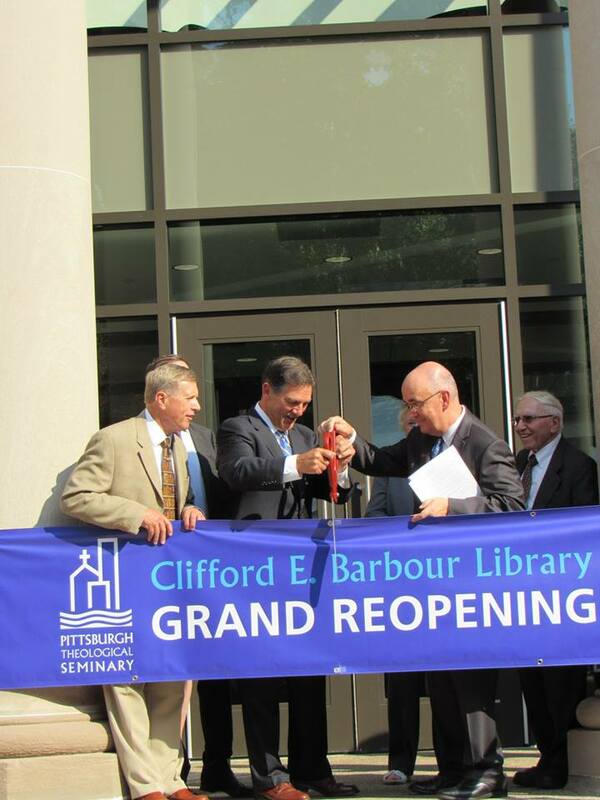 Pittsburgh Theological Seminary broke the seal on its fully renovated Clifford E. Barbour Library with a ribbon cutting and dedication service Sept. 21. This project addressed the full range of renovation needs to establish creative spaces that inspire people to engage with theological ideas and each other in community and collaboration; to incorporate innovation that supports theological reflection, inquiry and research; and to preserve the seminary’s collection purposefully. A prayer of dedication video can be viewed here. A more open floorplan with several different study and lounge areas. 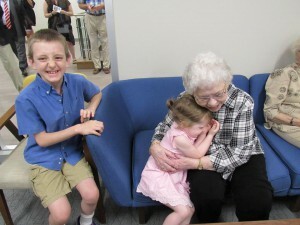 The seminary welcomes pastors and others to check out the library. Use the quiet space for sermon prep, meet with committees in the group study space, try out a new worship idea in the integrative learning space, or enjoy a cup of coffee in the café while reading about mission trends. The Fred Rogers Family Room helps keep children entertained in the Barbour Library. As a special event to celebrate the library’s reopening, on Friday, Nov. 9, from noon to 2 p.m. pastors and church leaders are invited to enjoy a complimentary lunch, tours of the new space and receive information about the library’s resources designed to serve them and their colleagues in their ministry context. Visitors can make a day of it by also visiting the Seminary’s Kelso Museum of Near Eastern Archaeology while in the neighborhood. 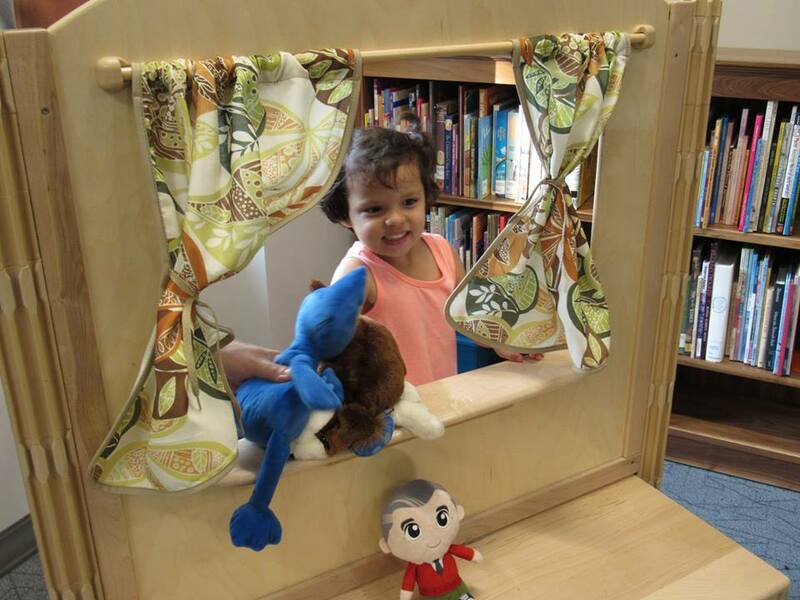 Library tours highlight the open and closed study carrels, Active Learning Space, Integrative Learning Space and Fred Rogers Family Room. Attend this event and receive complimentary borrowing privileges for one year. RSVP by Nov. 2 to Katie Yates (kyates@pts.edu; 412-924-1376) and help the seminary launch The Clifford E. Barbour Library into the next century. 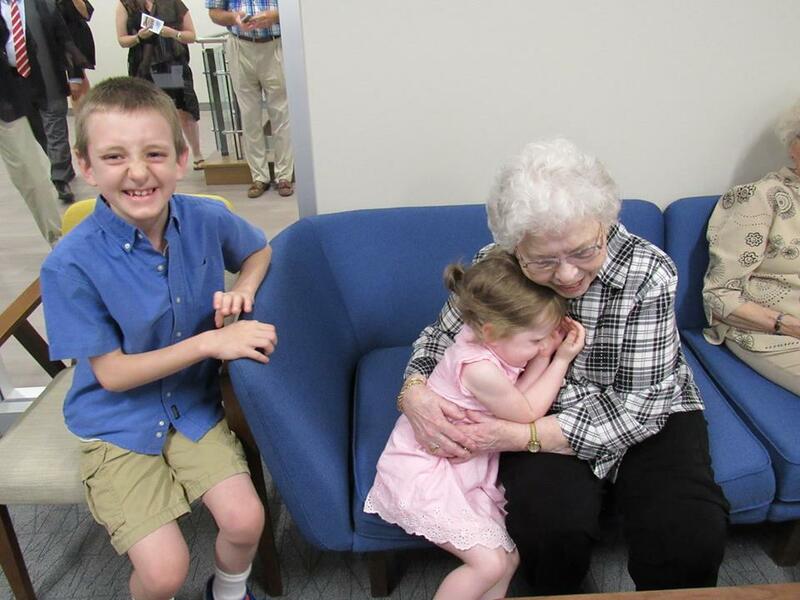 Joanne Rogers, the widow of Fred Rogers, hugs Lydia Davenport, the daughter of the seminary’s Miller Summer Youth Institute Directors Erin and Derek Davenport, as her brother, Dylan, looks on.